↑ ক খ Colin Martin, Geoffrey Parker,The Spanish Armada, Penguin Books, 1999, আইএসবিএন ১-৯০১৩৪১-১৪-৩, p. 40. 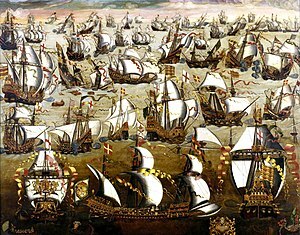 ↑ Colin Martin, Geoffrey Parker,The Spanish Armada, Penguin Books, 1999, আইএসবিএন ১-৯০১৩৪১-১৪-৩, pp.10, 13, 19, 26. Top Ten Myths and Muddles. Wes Ulm.